Wheel&Waves is dandies stretched out on their bikes or on the bonnet of an old van enjoying the sun where the Atlantic Coast meets the Pyrenees (or myabe just trying to recover from a hangover after a night of partying). The only time anyone raises an eyebrow is to pay homage when one bike rumbles more than the others. It’s surfers from all over the world looking north-west, waiting for the perfect wave at Milady beach (actually they don’t wait at all, they paddle out past the rocks from 9 am on). It’s individuals covered in tattoos who roll in with sidecars covered in dust after having driven thousands of kilometres and who walk around holding beers, their hands coated black from tens of amorous encounters with the engine. It’s refined customisers who brought over their creations in business class and who, when they are not busy polishing their work, spend their time grooming at the Village’s hipster barber shop. It’s the continuous rumbling of “rides out“, group excursions along the winding roads of the Basque Country, which could very well be dubbed “Wild Country” for the event. It’s music from morning to night, with the participation of such legendary individuals as Elliot Murphy. It’s girls taking group selfies with the bikes on display. It’s amateur skaters alongside skaters, like Steve Caballero, who have made history. It’s also families on holiday with one child strapped to their back and another in a pram as they work their way through the stands to take home two “67-68 Airborne Vietnam” t-shirts. And, of course, it’s Moto Guzzi participating once more in this important event with one of the liveliest and most popular stands, where visitors were able to admire the new V7 and V9 models and some important customisations straight from Lord of the Bikes, like the eye-catching, high-tech Hab-Ola by Svako Motorcycles (based on the V7III Special), the exaggerated Japanese-style Vertigine by Vibrazioni Art Design (based on the Audace), and the magnificent SLCDR (Atelier Sur Les Chapeux De Roues) based on the 1981 1000 G5, which caught the eye and earned the admiration even of the proudest and most competitive private customisers. In short, the sixth edition of the festival, held from 14 to 18 June in Biarritz, and dubbed “the year of the legends” by organisers was dedicated to customised bikes (with a special preference for scrambler, café racer and fast-track) and to the styles and values that unite this world with other worlds that share an equal reverence for freedom, like surfing, skating and music. The heart of the event is the Village: a wedge-shaped piece of earth on the edge of Biarritz that narrows as it nears Milady beach and is filled to the limit with official manufacturers’ stands, customisers’ stands, and stores where one can personalise a bike helmet or buy anything else needed for an authentic biker look, besides the finger food trucks that become increasingly important as the hours go by. Beer? Naturally, and ice-cold of course, but all the better if one takes part in a refined champagne tasting between one beer and the next. The craziest attraction, though, the one that draws crowds throughout the day is the great “Wall of Death“. Seen from the outside, it has the appearance of an enormous wooden keg some 40 metres tall with a ring on top where people can stand and look down on the inside. 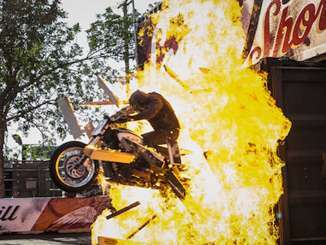 But it’s what goes on inside that earns the roaring applause and the stomping of feet: inside the “Wall of Death” expert acrobatic riders ride their bikes in circles around the sides of the keg, horizontal to the ground. They never fall thanks to the centrifugal force generated by moving at such high speeds, which keeps them glued to the wooden walls. And, if that wasn’t enough, these magicians on wheels are born performers: they let go of the handlebars, sit sideways or even stand on their bikes (which are still horizontal to the ground!) and greet the audience with the typical gestures of the corrida as they zip past. The air under the large tent that covers the “Wall of Death” soon fills with the pungent smell of petrol, roaring engines and the boisterous enthusiasm of the crowd. Once energised by the lively event, it’s time to explore the rest of the Village: as we near the beach, right before the stretch that leads down to the water, there’s a small roundabout for rides out and for those who want to test ride a bike: as Moto Guzzi, we were the only ones to offer test rides near the Village this year. There’s an unending coming and going as bikes head inland, toward San Sebastian just across the border in Spain, where flat-track races and “shots” (short uphill races) are being held, or excursions to the beautiful centre of Biarritz, with its refined streets that look and feel like Montecarlo, plus strolls along the seafront, the towering view of the Grand Hotel, and Café Miguel, which is completely surrounded by parked motorcycles every night. After a day in the cheerful chaos of the Village, it’s time for everyone to relax a little. So we move along to Biarritz, where Moto Guzzi has booked the Crampotte 30 for an evening: white walls, red tables and green windows, to get to the restaurant one walks down a steep road from the centre of town to a small square and a hidden port surrounded by large rocks. Just above the restaurant there’s a beautiful church that overlooks the sea, with young people sitting on the railings to enjoy the sunset and make fun of the foreigners. A drink, a light snack, some photos of the boats as they rock gently in the sunset, and it’s time to call it a night. Tomorrow will be a day of uphill racing at Punk’s Peak in Jaizkibel, not far from San Sebastian.